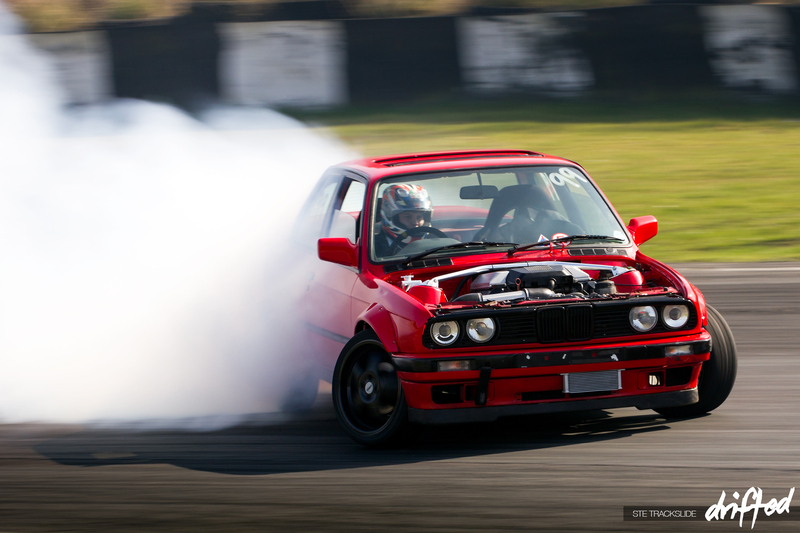 A Story of Progression: Darren Rickaby and his BMW E30 V8. I’ve known Darren for a number of years now and I have watched him progress from a novice driver with not a lot of confidence to a well known competition driver in the UK drift scene. 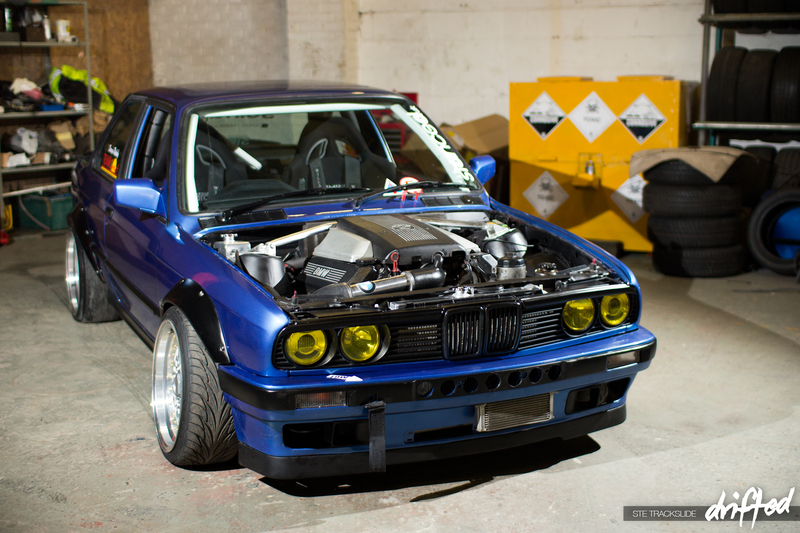 As well as watching his driving skills improve and his confidence grow, I’ve also watched his BMW e30 take shape during its long and ever evolving development. 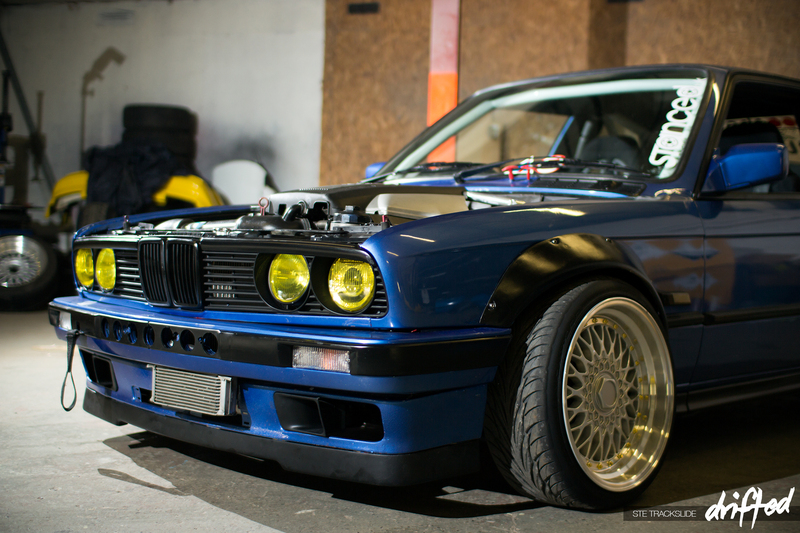 Personally I’m not a very big fan of BMWs, but I can honestly say, I am a fan of this one. I can remember the first time I saw Darren’s car at Teesside Autodrome back in 2011, as well as hearing peoples’ opinions of it. Darren was working with local drift team & fabrication company, Team Sunset, to develop the lock kit at the time and it did look a little strange. No overfenders and the front wheels were sticking out by a good 50mm. I remember hearing “it looks broken”, a lot. One of the things that did grab peoples’ attention (for the right reasons), was that it had just had an M60 V8 fitted. That is very cool, and a long way from the stock engine, as this shell was originally a 316i. Over the following months the finer touches were added. New wheels, arch extensions, as well as a few other cosmetic and performance parts. 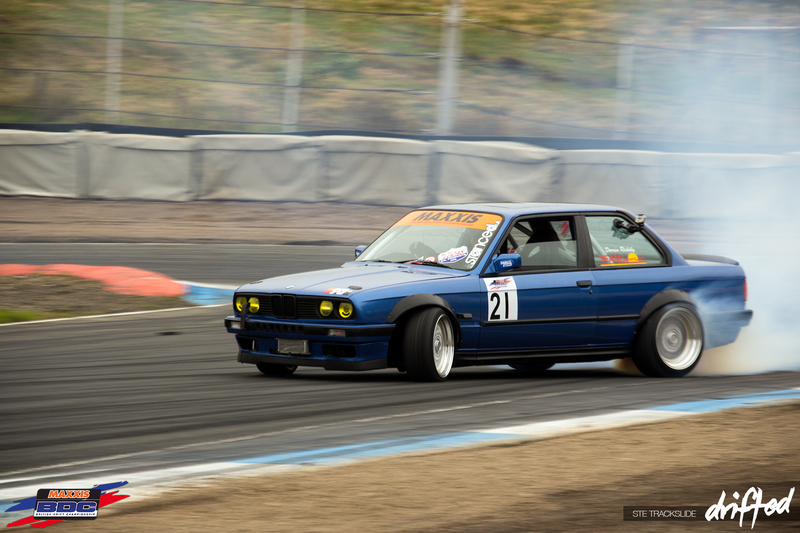 The car was running great and Darren was really getting the hang of drifting it. Seen here with the bonnet off as that engine gets quite hot while idling at the line, and if I remember correctly, this was a rather hot day. 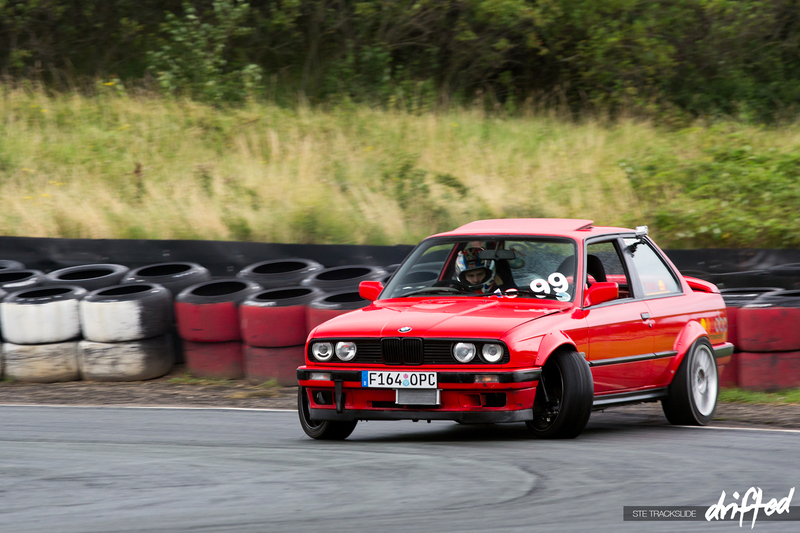 2012 saw Darren in his first competition event, the Northern Drift Championship at Teesside Autodrome. Once Darren began pushing hard (and he was), you could really see the amount of lock he was getting from that custom lock kit. I believe it was in the region of 72 degrees at last check, which is just insane. He came 1st in NDC rounds 1 & 2, then 2nd in round 3 and 3rd in round 4 in the novice class. Not bad for his first competition event. The Northeast Motorfest 2012 at the Nissan Factory in Sunderland was a relatively new event and Darren’s second competition event outside of the ongoing Northern Drift Championship. Here he was up against a high class of driving as a few British Drift Championship super pro drivers and Drift Allstars drivers were also in attendance. Darren qualified 13th overall out of around 30 drivers; he was knocked out early due to undertaking someone. In the early months of 2013 I received quite a few texts from Darren about his plans for the year. One of his biggest decisions was on whether to repaint the car or not. 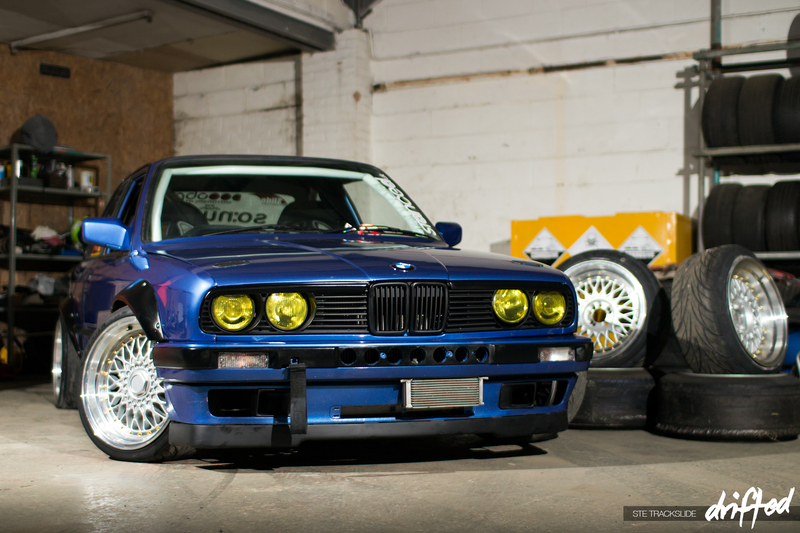 After what seemed like an age, he decided to put a modern twist on this classic and went for a new colour; BMW Estoril blue 2. I visited the Team Sunset HQ after the shell was painted and the car was being re-assembled. 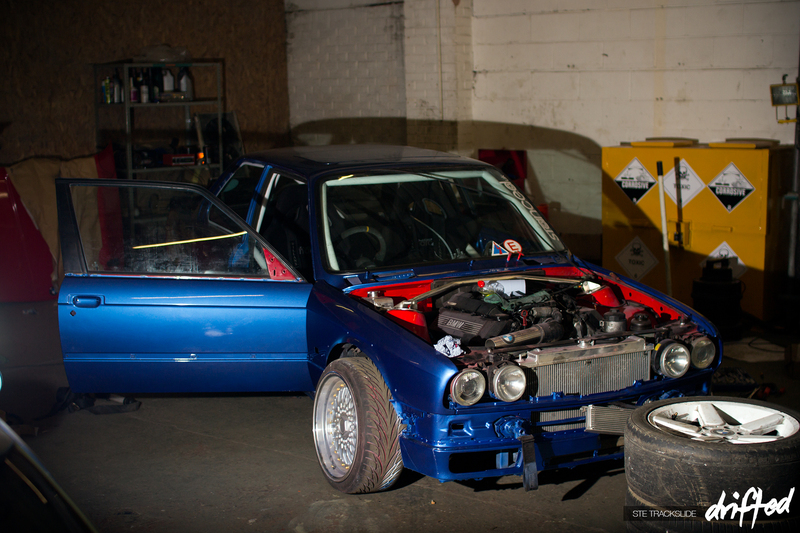 As Darren was planning on competing in the British Drift Championship in 2013, during the extreme make over the e30 received a new 6-point custom rollcage. A new set of Dare DR-RS alloy wheels were purchased and the dash was out for flocking; it was really starting to come together. During my final visit everything was just getting buttoned up (I even lent a hand preparing the arch extensions for paint). The engine bay was painted, the bumpers, all trim and freshly flocked dash were fitted; it was ready for action and looking awesome. After the rebuild there was time for one practice day before BDC Round 3, that would be Darren’s first BDC event. With his temporary fiberglass bonnet fitted, he is seen here holding his own against an extremely quick Full-Carbon S2000 Turbo. 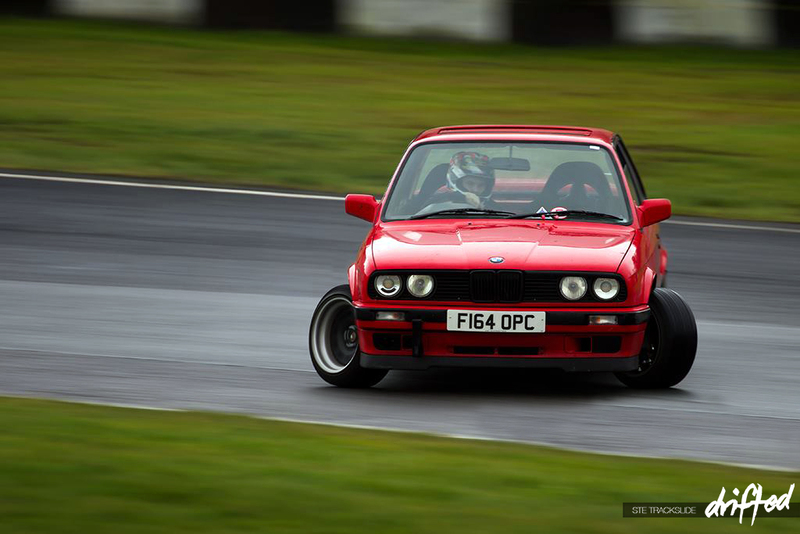 During round 3 of the British Drift Championship 2013, Darren qualified 6th out of around 35 drivers in Semi Pro, but unfortunately he was knocked out fairly early on. 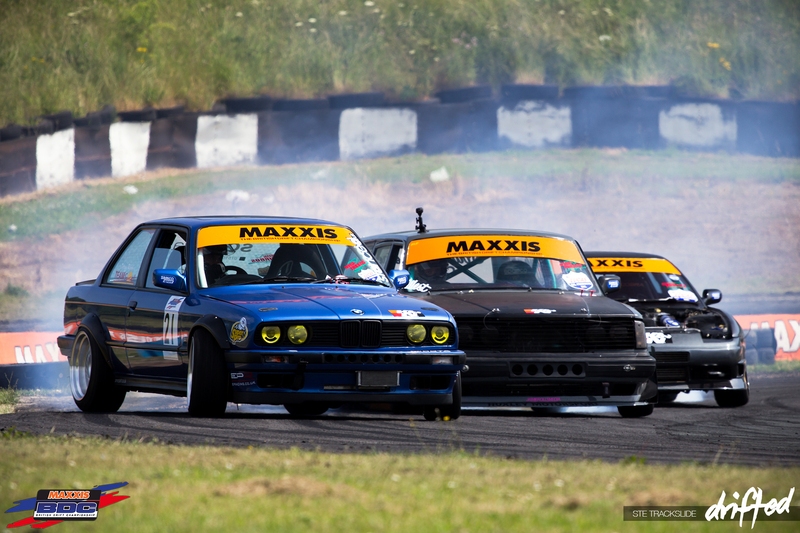 The weekend wasn’t over however, as the BDC Team Triple event was a few days later. 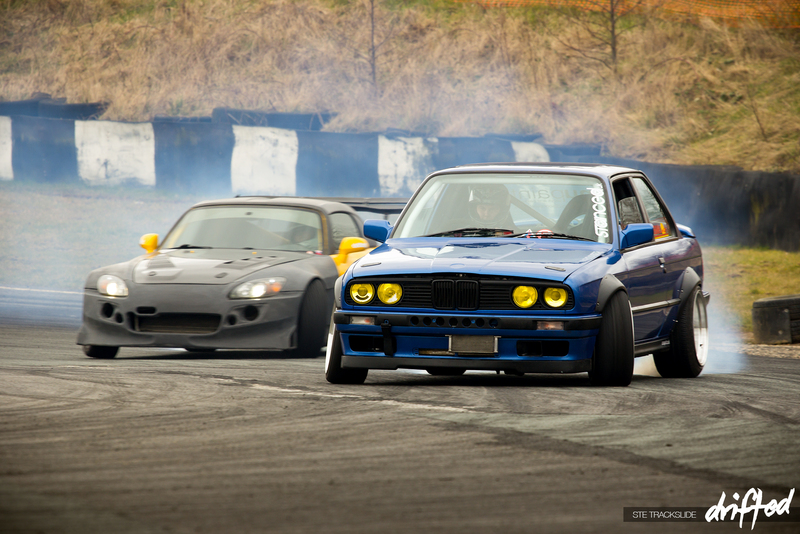 The BDC’s Team Triple event is a personal favourite of mine. It allows full teams to run together, but also gets the solo-guys in to teams, creating new friendships and making newcomers feel welcome. 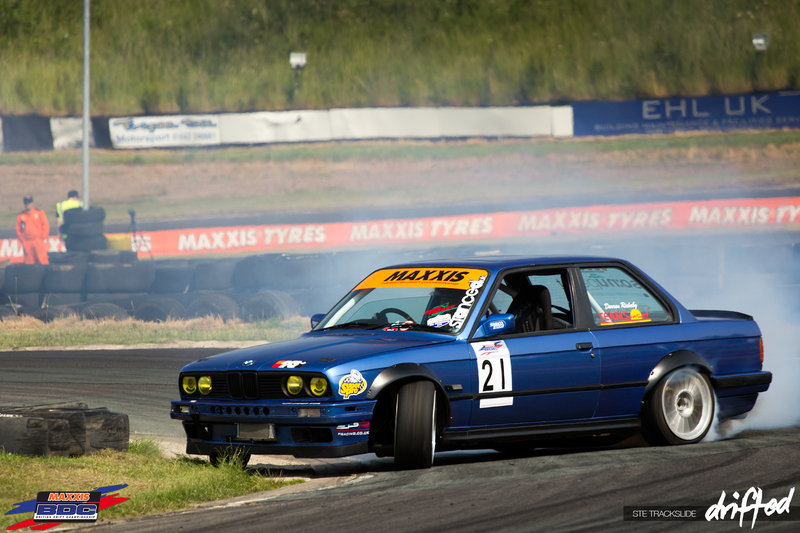 Darren was teamed up with Marc Huxley (Volvo of Doom) and Chris Hawkins (S13) in Team Treads of Malvern. After many ‘one more times’ they finished in 3rd place. At Round 6 of the British Drift Championship was at Knockhill Race Circuit in Scotland, Darren Qualified 6th in the Semi Pro class. After the competition season had finished, we arranged to meet and hit a few different locations for a few pictures. When this car is out and around town it gets quite a bit of attention. 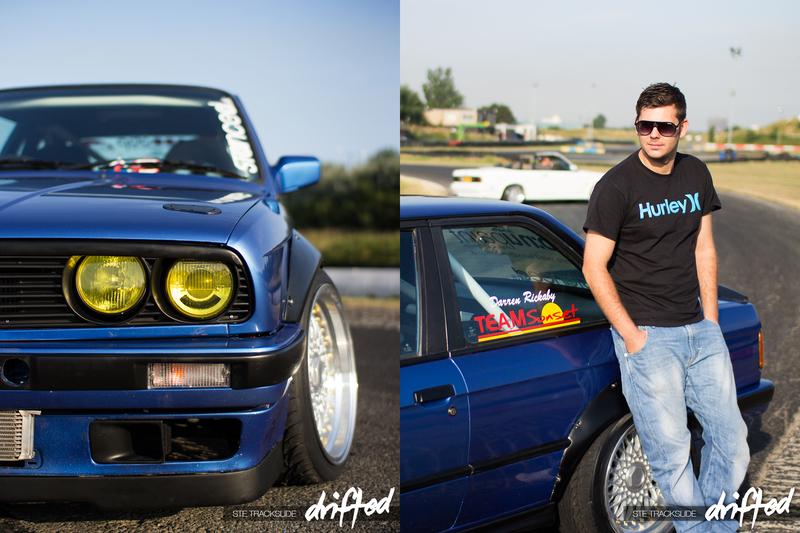 I’ve enjoyed watching the combination of both this car and driver evolve from their very early days in drifting. 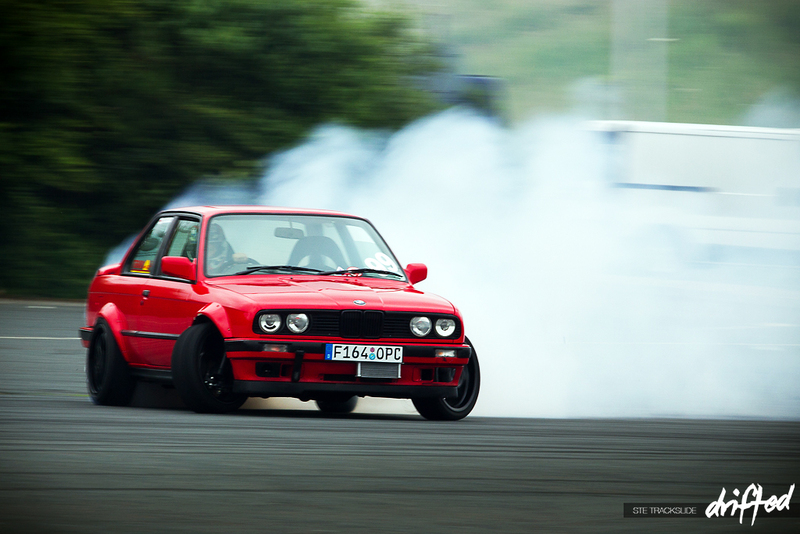 Darren will be continuing to participate in drifting events, and there are even more plans in the pipeline for this awesome e30 V8. Be sure to check out his Facebook page to keep up to date on all his plans and progress.